Come and take your pick from a dazzling array of 20th century clothing, accessories, jewellery, homeware, decorative items, furniture, textiles, luggage, toys, vinyl, books, ephemera, collectables, curiosities and oddities gathered for your delectation by our crack team of specialist vintage traders. Grandma Eileen’s - women’s vintage clothing 1960s-80s, plus mid-century homeware. lovefromriabeer - retro homeware, kitschy bits and an assortment of fabulous retro garments. Gleam Vintage - atomic and mid-century homeware. Out Of The Past - men's vintage clothing and accessories, 1950s-80s. Marion Rowbottom - vintage women’s (and some men’s) clothing and accessories, mainly 1940s-50s. Nasi Lemak Street Food - excitingly spicy Malaysian street food that’s already proved a big hit at Foodie Friday and Tandem Coffee House. The finest refreshments will be offered by Nasi Lemak as mentioned above, along with the world-class award-winning Lord of the Pies, with espresso-based beverages and teas from Kandoo Coffee and sweet delights from everyone’s favourite award-winning cake creator, Stuart Thornley Cake Design. Plus there’s the welcome return of Popscycle with their ices and lollies served from a gorgeous Schwinn! There's a Facebook event page just waiting for you to register your attendance, if you fancy! And please feel free to invite all your pals and share it extensively. Last but not least, here's some of the truly wonderful traders who have dedicated long hours, and clocked up extensive mileage, to accumulate a thrilling assortment of unpredictable vintage goodies just for you! Andy Wilcox - meticulously restored and rejuvenated portable record players from the 1950s-70s, ready for you to plug in and play. Aspidistra Vintage - mid-century homeware, glass, ceramics, jewellery and clothes. Bijou & Vintage - vintage fashion, accessories and bridal wear through the decades. Bluecat Jewellery - vintage jewellery, clothing, accessories and homeware. Boomerang Vintage & Retro - a fabulous range of 1950s-60s home ware including funky formica tables, kitsch collectables and stylish mid-century classics. Diana Black Vintage - vintage homeware, mostly mid-century. Emma Brannick - vintage homeware and clothing. Garbo Antiques - women’s and men’s vintage clothing, accessories, costume jewellery, fabric and trimmings 1880s-1960s. With even more Garbo at 20th Century Stores! Gem’s Bits n Bobs - vintage women's apparel, toys, mid-century furniture, bric-a-brac, pictures, accessories, dead stock costume jewellery. NEW! Gleam Vintage - atomic and mid-century homeware. NEW! Grandma Eileen’s - women's clothing mostly 60s-80s plus some mid-century homewares. NEW! lovefromriabeer - retro homeware, kitschy bits and an assortment of fabulous retro garments. NEW! Marion Rowbottom - vintage women’s (and some men’s) clothing and accessories, mainly 1940s-50s. Mick’s Goodies - weird and wacky collectables and small furniture. And there's more at 20th Century Stores. Modernist Mid-Century - mid-century posters, artwork, objets d'art, iconic items of design, homeware, glassware, ceramics, books, records, etc. There's more at 20th Century Stores too! new-patina - vintage furniture, homeware, decorative items etc. NEW! Out Of The Past - men's vintage clothing and accessories, 1950s-80s. Retrodecs - vintage coats and jackets; china, homeware, decorative items. Find them in the market hall, and in 20th Century Stores. RetroFunky - vintage homeware, decor, kitsch, textiles, small furniture, collectables. 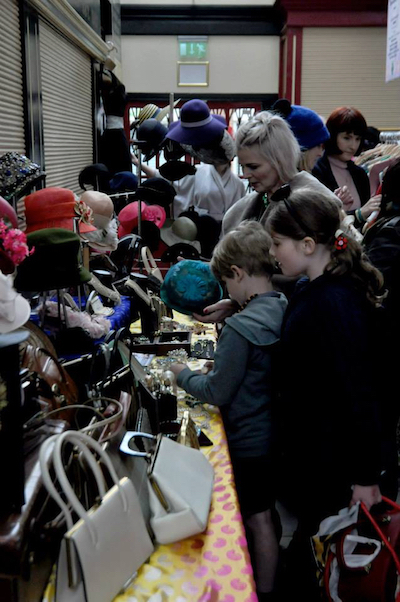 Retrorags - men’s and women’s vintage clothing, bags, accessories and homeware. Sarah’s Second Chance - vintage collectables, homeware, jewellery and costume. Sheila’s Store - vintage jewellery, suitcases and odds and ends. Shiny Shilling Vintage - homeware 1940-70s including ceramics, glass, kitchenalia, decorative objects, books and art. Snygg - Stockport’s Funky Pot Royalty, also offering equally stylish glassware, homeware and decor, textiles, slightly scary chalkware religious icons and lots of other fun stuff. Find them at 20th Century Stores. July's poster stars, Bill and Michelle! 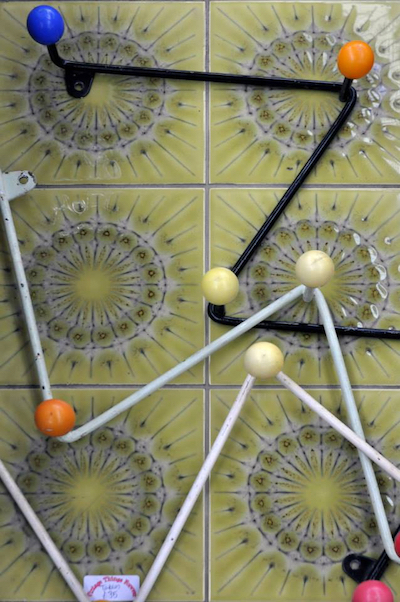 Marvellous mid-century homeware from Vintage Things Forever. Photo by Stephen Marland. 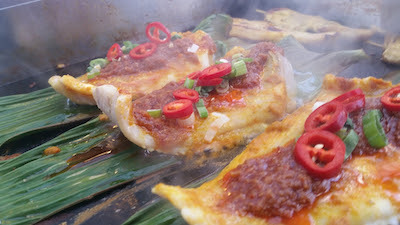 Nasi Lemak Street Food's signature dish: Ikan Bakar, grilled banana leaf fish. Try some at this fair! 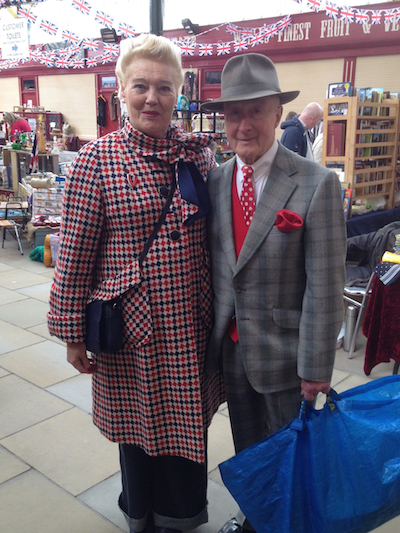 You have to be quick to beat Vivienne and Malcolm to the bargains! Browsing Mary Jones Vintage. Photo by Stephen Marland. Stuart Thornley Cake Design - the reigning king of sweet bakery treats, innovator of extraordinary and amusing novelties, and an essential stop on your tour around our fair. Check his menu for July above. Sue Booth’s Sparkle - vintage jewellery and bric-a-brac. The Side Room - vintage clothing, linens, costume jewellery, cutlery and homeware. 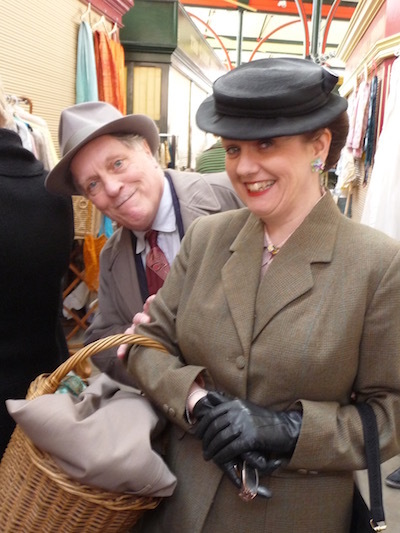 TinTrunk - an extensive range of top quality 20th century luggage plus costume jewellery, homeware, textiles, collectables. Find TinTrunk at 20th Century Stores. Value Vintage - men's and women's vintage clothing. Vintage Things Forever - an eclectic mix of vintage homeware, small furniture and curiosities! WaxDelirium - vintage vinyl, books, ephemera, photos and the odd bit of homeware and furniture, now resident in 20th Century Stores. We Used To Have One Of Those - vintage photographic/audio visual equipment and media; books, posters, comics, magazines, ephemera, toys, novelties, games, and household items.